Published: Dec. 23, 2018 at 02:23 p.m.
Green Bay Packers running back Jamaal Williams rushes for a 7-yard touchdown. Published: Dec. 16, 2018 at 03:06 p.m.
Green Bay Packers running back Jamaal Williams rushes for a 10-yard touchdown. Published: Dec. 16, 2018 at 02:28 p.m.
Green Bay Packers running back Jamaal Williams rushes for a 20-yard gain. 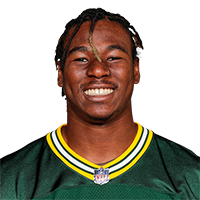 Published: Oct. 28, 2018 at 05:01 p.m.
Green Bay Packers running back Jamaal Williams scores on the 1-yard touchdown run.